Obesity is one of the greatest health concerns facing our pets. It can cause unnecessary suffering and shortened lifespan. Your dog depends on you … help him live the healthiest life possible. Obesity and extra weight puts pets at risk for certain health problems including diabetes, joint dysfunction, orthopedic problems, heart disease and stroke. According to a 2000 Gallup Survey, obesity/weight management is the second highest health problem faced by pet owners, with an estimated 15 million obese dogs in the United States. Joint or locomotion difficulties … Extra pounds puts added stress on joints, bones, ligaments and muscles. Conditions such as arthritis, hip dysplasia, disk disease and ligament ruptures may be caused or aggravated by obesity. Heart and Respiratory Disease … Heart and lungs have to work harder to provide adequate oxygen and circulation. Also, extra fat in the chest cavity and around the heart muscle can decrease the efficiency of the heart and lungs. 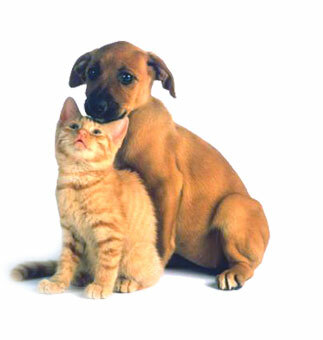 Diabetes … Just like people, diabetes is much more common in obese dogs and cats. Liver Disease … Obese animals are prone to liver disease. Heat Intolerance … Insulating properties of excessive fat make obese animals uncomfortable and unable to tolerate heat. Skin Problems … Obese animals often have trouble grooming themselves. The rolls of skin built up by fat deposits can often harbor dirt, bacteria and other harmful organisms. Gastrointestinal Disorder … Pancreatitis is seen all too often in obese dogs. This condition is painful and life threatening. Life’s Abundance Weight Loss Formula For Dogs is a food that actually works and can help keep your dog in robust good health with a shiny coat and the energy to live life to its fullest. Life’s Abundance Weight Loss Formula For Dogs is not, nor has ever been on any recall list. 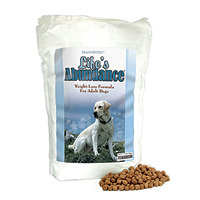 Life’s Abundance Dog Food is safe for your dog. How Can Life’s Abundance Weight Loss Formula Help My Dog Lose Weight? 28% less fat and over 400 fewer calories per serving to help reduce weight and maintain a healthy, as well as active and energetic lifestyle. Higher protein levels to aid metabolism and promote a lean, energetic body. More omega fatty acids for the healthiest skin and shiniest coat. And because Life’s Abundance Weight Loss Formula For Dogs has the complete and balanced nutrition adult dogs need, you can be assured that your dog can reach his or her optimal weight without compromising the great taste and balanced nutrition they deserve! The result is shedding unwanted extra pounds while retaining lean muscle, a shiny coat and robust good health. Life’s Abundance Weight Loss Food is always made with the freshest ingredients, which gives your dog the best quality possible! HealthyPetNet uses quality ingredient selection and an exclusive “fast-cook” process to preserve the fresh taste of natural foods like Life’s Abundance Weight Loss Formula For Dogs. This technique maintains natural flavors and nutritional value better than more rigorous cooking techniques found in many store bought products. There are no chemical additives or preservatives in Life’s Abundance Weight Loss Formula For Dogs. Not a single one. Life’s Abundance uses a blend of natural antioxidants to help Life’s Abundance Weight Loss Dog Food stay fresh as well as helping your dog to maintain a healthy immune system. Why did Dr. Jane Bicks develop Life’s Abundance Weight Loss Food? Provide the energy and overall good health to enjoy life to its fullest! Life’s Abundance Weight Loss Formula is concentrated, so you don’t need as much as you would of other types of food. The exact amount of food needed for your dog will vary according to age, temperament, activity level and environment. Start by feeding the recommended amount below based on your dog’s actual weight, not the desired weight. These feeding amounts are guidelines and may need to be adjusted (increased or decreased) to achieve your goal. Weight loss should not exceed 1% of your dog’s total body weight weekly, unless recommended by your veterinarian. (For example, if your dog weighs 50 pounds, a 1% weight loss would be one-half of a pound.) Once you decide on a feeding amount, we suggest you divide that amount into two to four small meals and feed over the course of a day. When switching to Life’s Abundance Weight Loss Food For Dogs, gradually feed less of your previous food and more of Life’s Abundance Weight Loss Food over a one week period to complete the transition. Over 100 lbs. 3 3/4 cups + 1/4 cups for each 10 lbs. of body weight over 100 lbs. Change food gradually. Dogs’ bodies and minds get accustomed to their food. Changing too suddenly might cause diarrhea and/or vomiting. Add small amounts of Life’s Abundance Weight Loss Food, perhaps 5-10 nuggets the first day, to the regular food. Note that whatever the amount of Life’s Abundance Weight Loss Dog Food you add, you must subtract from their regular food. Increase to 15-20 nuggets of Life’s Abundance Weight Loss Food the next week and watch for signs of loose stool due to the change in diet. If everything looks normal, increase to 1/8 of a cup and so on. Start to expect steady weight loss about a month after the successful conversion. Is Your Overweight Dog Eating Too Fast? Slower eating makes your dog feel full faster. Overweight dogs usually eat too fast. By slowing down the dog’s eating process to a healthy and moderate pace, this problem can be eradicated. When a dog eats too fast, he or she can choke, swallow so much air that they vomit or even develop bloat, which can be life threatening. Preventing your dog from eating too fast is an important part of properly caring for your pet. One very easy way to prevent your dog from eating too quickly is to place a large rock (be CERTAIN it is too large for the dog to eat) in the center of their food dish. Some people use 2 or 3 large rocks if your dish is large enough. This will cause the dog to have to work around the rock to get the food. Be sure to clean the rock before and after use in the dishwasher. Would you like to increase your income? Whether you just want to feed your dog or cat for free, earn a wonderful monthly income or have a nice retirement, you can join us and share Life’s Abundance pet products and this incredible one-of-a-kind pet business with others! Offering pet lovers the best natural pet food, treats and supplements on the market today could add years to the lives of their pets while you make money! Listen to a Phone Call, or Visit a Website…You Can Be Successful. call (281) 205-0429 or email me and I’ll be happy to help you!